Delicious, low-fat, gluten-free banana nut bread made two-ways! So moist and delicious, you can’t tell it’s light. My family went bananas for this!! My aunt recently started following a gluten-free diet, and my close friend has Celiac, so lately I’ve been dabbling more with gluten-free baking. I had a large bunch of over-ripe bananas sitting on my counter and decided to experiment taking my favorite Low-fat Banana Nut Bread Recipe and making it gluten-free. Since the recipe makes two loafs (yes you can halve it if you wish) I thought why not use two different gluten-free flours to see which yields the best results. Not having a ton of experience baking gluten-free, and seeing how much fat is usually used in gluten-free baked goods, I wasn’t sure how this would turn out, but the results were EXCELLENT! This was easier than I thought it would be, I was fully prepared to test this a few times but it worked on the first shot, and they were both equally delicious. The bread on the above left photo was made with brown rice flour instead of wheat flour; the bread on the above right photo I swapped the wheat flour for Bob’s Red Mill Gluten-Free All Purpose Flour. I then had my aunt, friends, daughter and husband help me taste test them to see which was better and the results were mixed. My favorite was the Bob’s Red Mill, to me it tasted closest to my original recipe. But some of my friends liked the brown rice one better because they liked that it had a cakier texture, something that is difficult to achieve with gluten-free baking. My 4-year old daughter loved them both! So I’ll let you decide which way you want to make it, and if you want the original wheat version, here’s the link. I gave you the nutritional info for both, with and without the nuts! Since this recipe makes two, you can freeze the second loaf. Wrap tightly with plastic wrap and store in the freezer. You can also slice the bread and wrap individual slices. Can be frozen 2 to 4 months. Thaw, wrapped at room temperature before serving. 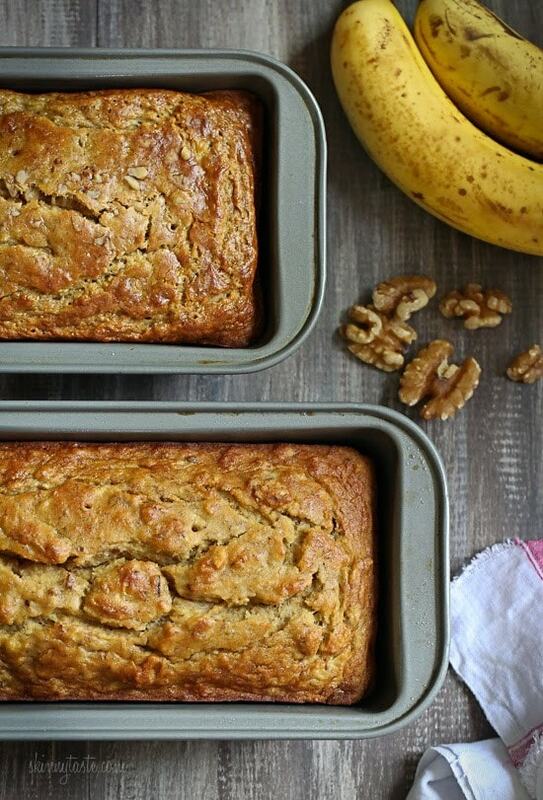 Delicious, low-fat, gluten-free banana nut bread made two-ways! So moist and delicious, you can’t tell it’s light. My family went bananas for this!! Preheat oven to 350°F. Spray two 8×5 inch nonstick loaf pans with baking spray. In a medium bowl, combine the flour, baking soda and salt with a wire whisk. Set aside. In a large bowl cream butter and sugar with an electric mixer. Add egg whites, bananas, apple sauce and vanilla, and beat at medium speed until thick. Scrape down sides of the bowl. Add flour mixture and walnuts (if using), then blend at low speed until combined. Do not over mix. Pour batter into loaf pans and bake on the center rack for 45 to 50 minutes, or until a toothpick inserted in the center comes out clean. Let the pan cool at least 20 minutes to bring it to room temperature before slicing. I just made this recipe and it is sooo good but is it supposed to be “doughy” in the middle? Thanks! Simply put, easy and delicious. This was the perfect recipe for me. It was easy, fell in line with my gluten free lifestyle and my love of cake. Not being able to eat cake has been the hardest part of being GF for me, which is a must. I LOVE CAKE. I made this using brown rice flour,first time baking with this type of flour. This came out great. I did have to bake it for 90 minutes, but for full disclosure I used my mini toaster/convection oven, which may explain the lengthy cooking time. Next time,yes there will be a next time, I’ll use my air fryer. Baked goods come out great in those. My loaves looked exactly like Gina’s. I drizzled some ginger syrup over the top, once the loaves where done to give it a little spice. 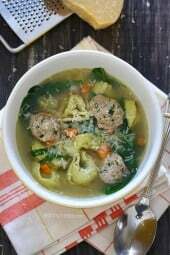 Great and well explained recipes on this site. Thank you. I like it. The flavor came out really good but the bread was not moist and soft, instead it was hard. What could it be?? Can I use almond flour as a substitute? 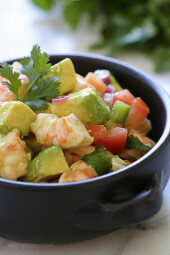 I’ve ried this recipe once and absolutely loved it. I‘m trying to adopt a vegan lifestyle, so how can I make this recipe vegan? Can you use Coconut Flour instead? It’s still Gluten free. Would you use the same amount of flour? Do you think this would work with almond or paleo flour? I made it with all the listed ingredients except the flour was the same brand, but was the regular wheat kind. I accidentally added the applesauce with the dry ingredients before mixing so maybe that’s where things went wrong. It was very wet after 50 minutes. I baked it an additional 10 minutes and the middle pieces were still completely mushy. I put it in the oven for 15 more minutes and it looked better but still a little mushy. Hoping it is better after sitting overnight. Can anyone think of why it was so mushy? Maybe the bananas I used were too ripe, or too large? I divided the ingredients by half by the way since I just wanted one loaf. The two ends we had were delicious! Hope the rest comes out okay tomorrow. This is an excellent recipe! I’ve been searching for a good banana bread since I developed a gluten allergy 5 years ago, this is i! great banana flavor and very moist! My picky son, that smirks at gluten free products, love it! Thanks so much! Love your recipes! I really wish the measurements had a weight conversion. Could you make this in muffin tins? Trying to work on portion control? Also if made into muffins how long would it bake them for? Was so excited to see this recipe- & with 2 versions. Wow! Awesome! I’m trying to cut down on sugar. Could 1/2 the brown sugar be substituted with Stevia granules? Thank you!!! i baked this last night and it was delicious. has anyone ever made this into muffins? I baked this bread and I am disappointed. The bread tasted undone. Baked it an additional 10 minutes and it was still way too moist. I”m sure it’s not the recipe…I used Bob’s Red Mill – 1 to 1 Baking Flour and the bread didn’t rise well. Also, it was extremely sweet; I used organic coconut palm sugar. I’ll try it next time with listed ingredients. Interesting, it turned out fine for me. This was amazing! I didn’t see how it would work without milk or oil, and it didn’t say to beat the egg white separately first . . . and I was worried when the mixture didn’t really thicken. And of course g-f flour here in Australia is different, but . . . the end product is delicious! Thank you. Can we use gluten free coconut flour? I haven’t tried, not sure that would work. I have a vitamix and usually grind my own brown rice flour, I suppose this would work instead of buying some. Also, could you make this recipe into a zucchini bread recipe instead of banana bread? If so how much zucchini do you think you would need? I have 2 recipes for zucchini bread, you can search for them from the main page. I love banana bread. Thanks for the recipe! my favorite is banana bread ! I Like this recipe! This banana bread with walnuts looks very nice! This looks mouthwatering! Very nicely presented. Bread looks delicious, but I hope it is not too sweet? I've been directed to cut gluten from my diet so I'm excited to see that both of these recipes with the different flours turned out. Thanks for sharing! Great! hugry now, I have to try this this week. Thank you for sharing! What is considered a "slice"? How many slices do you get out of each loaf? WAIT! Don't lose the water that is released! My second batch came out very dry, and I realized that I had put the banana water in the mix. Microwave still makes the bananas easier to mash, but put the water in with the bananas again. OOOPS! Excellent. Light, as you say, but with LOTS of banana flavor. I used a trick from America's Test Kitchen, microwaving the bananas for about 4 min to get them to release a little water. Poured that off (a quarter cup, maybe) and saved it for a smoothie in the morning. Then mashed bananas with my potato ricer. I like how this held together despite being GF (Used Bob's Red Mill GF AP) I will make it again, especially when they pack up aging bananas cheap at the store. Gina, Thanks so much for a wonderful recipe! I had an opened package of Bob's Red Mill GF biscuit and baking mix I had used for quiche with disappointing results and have been reluctant to "ruin" another recipe with it, but hadn't quite brought myself to throwing it out. When you said you actually preferred the banana bread with the Bob's GF AP flour mix, I decided to try it. I made banana nut muffins and they are delicious! I accidentally used 1 less banana than the recipe called for and they were still perfect! Maybe my bananas were more "Large" than "Medium", or this is just a very forgiving recipe! Either way, it's a new favorite in my repertoire! Made this and it came out perfectly! I only made one loaf so i halved the recipe and used 2.5 bananas. also added some chocolate chips. Came out moist, fluffy and sooooo good! Delicious and healthy, thank you!! 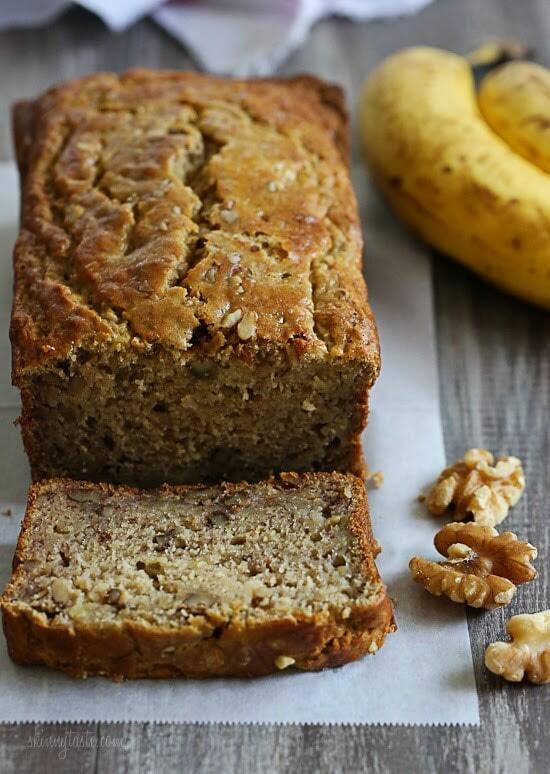 This banana bread with walnuts looks very nice. Made this over the weekend and I'm so thankful it makes two! So thankful for the GF option. Look forward to more…pumpkin bread! This is in the oven as I speak. Can this be frozen? Best way to freeze the bread? Thanks so much for that post! I have to try it! This looks amazing 🙂 I must try this! Trust me….its a good one! can these be frozen? and still taste good when you get them out? This was delicious, we made it yesterday. I love banana bread and my husband is gluten free, this recipe was much healthier and taste as good as my go-to one. This is the new go-to :). Thank you! Hi, Gina, these sound so yummy, many thanks. Can't wait to try it… now I need some ripe banana. BTW, can I take 1 loaf and freeze it? I am a long time fan and user of your blog – and now cookbook – and recently went gluten free due to a doctor's suggestion (after years and years of being in pain and having a horrible relationship with food, I am actually eating these days and am not in horrible pain. It's WONDERFUL!) Anyway, when I realized I could sort by GF here, I got so excited… and I am also excited you are baking more GF things now because in the 2 months I have been doing this, I have found that the baking part is the hardest! Anyway, thank you thank you thank you!!! Because my helps me with recipe testing and is now gluten-free, I will be adding a lot more baking. Glad it helped! My cookbook has about 95 GF recipes!! This looks awesome, I must try a gluten free recipe! Finally got your book today at Target! I love it! We are a gluten-free home as my son is wheat allergic. My brother is egg allergic and if you can have flax seed, there are quite a few recipes out there if you Google. Bob's Red Mill has a recipe. Here is what my brother uses: http://www.ener-g.com/egg-replacer.html I hope this helps. 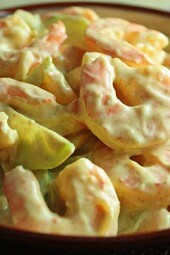 Love this banana recipe:) Your photos look great. I think I have to try this this week. Thank you for sharing! I have bananas ripening on my counter as we speak for your banana oat muffins from your cookbook. Can't wait to make them in a couple of days! 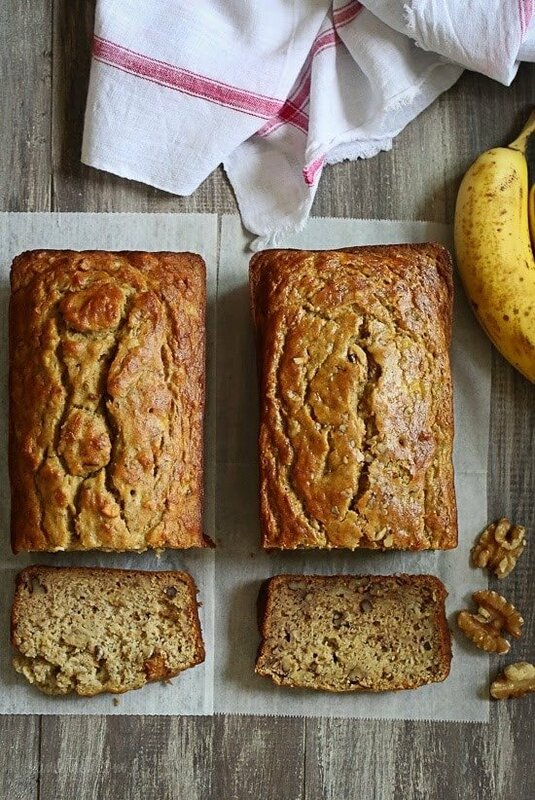 This banana bread looks amazing, I've never cooked gluten-free but I may just try this recipe out! I've just dipped my toe into gluten free baking, but this looks so fabulous I need to try again. Simply stunning photo! Have you tried using green banana flour as a gluten free option, it's wonderful. No, I never even saw that. I'm not a huge fan of gluten free, but this looks so amazing I may just have to try it! Ooooh this looks so good! Gina! Thank you for this! <3 I'm so excited right now! I need some super ripe bananas now. LOL! Yum! Kay – I read that you can quickly ripen bananas for baking by putting them in a 300 degree oven for about 40 minutes (until the skin is black and shiny. Let them cool, cut off the bottom end and squeeze right into the mixing bowl. I haven't tried it. I love that you put a gluten free baked good recipe on your website! I am celiac and am always looking for healthy and gluten free recipes. Thank you! Great, hope you enjoy it! I know how hard it is to make baked GF recipes light.